The leading independent specialist for windscreen replacement and windscreen repair based in Coventry and serving all of the Coventry area. National Windscreens Coventry fitting centre provides windscreen replacement and windscreen repair services to businesses and individuals throughout Coventry and the Coventry area. 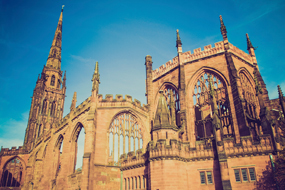 The city of Coventry is situated in the centre of the UK, 95 miles from London and 19 miles from Birmingham. The city is ideally situated on the A45, A444 as well as the M69, M6, M40 and M42 which makes it extremely easy to travel to different parts of the country from Coventry. Much of the city was rebuilt after the Luftwaffe bombings in 1940. Additionally Coventry was the world’s first twin town when it formed a twinning relationship with the Russian city of Stalingrad during the Second World War. The Coventry windscreen fitting centre and its mobile vehicle glass technicians service the needs of Coventry and the surrounding area including Nuneaton, Rugby, Hinckley and Longford. With 108 fitting centres and over 800 mobile technicians, National Windscreens operates the UK's largest windscreen repair and windscreen replacement network. The company provides low cost, high quality windscreen replacement and windscreen repair from its Coventry fitting centre 24 hours a day, 7 days a week, 365 days a year. Repair and replacement of all types of vehicle glass including windscreens, rear windows and side windows is undertaken throughout Coventry and all of the Coventry area.